After 10 days of age, the only remnant of the yolk sac is a small tag of scar tissue, called Meckel’s diverticulum. This tag, located on the antimesenteric side of the intestine, contains lymphoid tissue and is part of the GALT, or Gut Associated Lymphoid Tissue. 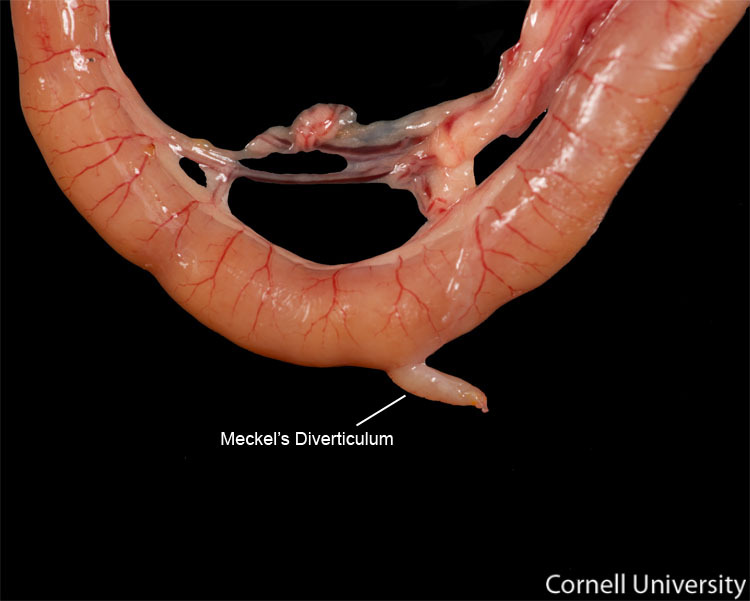 Meckel’s diverticulum is also an important anatomical landmark, as it is located at the junction between the jejunum and the ileum. Being able to differentiate the jejunum from the ileum is important to generating differentials for intestinal diseases. Some infections, such as coccidiosis, have a predilection for the jejunum and other diseases target the ileum.